Across the Pittsburgh region, schools, volunteers and community partners are delivering a consistent message to students about school attendance: Be There! Launched in 2013 by the United Way of Allegheny County, the Be There Campaign has reached 12,000 students across 21 school districts. More than 500 volunteers have been engaged, 300 community partners are committed to the campaign, and 12 partners are serving on the advisory committee. The campaign blends a county-wide messaging campaign with a community-based, data-driven approach to ensure that fewer students fall behind academically because of chronic absenteeism. Joshua Childs, at the University of Texas at Austin published an update of Pittsburg's Be There Campaign in National Civic Review. The day before the forum, the United Way and the Office of Child Development also collaborated with Pittsburgh Public Schools to ensure it had even greater support to carry out these ideas. They held a series of special sessions to engage principals, parents, early childhood providers and others in understanding what chronic absence is, how they could make a difference, and what the district’s data revealed. Like many community efforts, the Be There Campaign emphasizes positive messaging and incentives that can encourage all students to come to school regularly. An Attendance Challenge Toolkit lays out the different sorts of contests and incentives that schools can offer and provides a step-by-step guide to successful challenges. There are free resources given to anyone interested, including stickers, small incentives and school supplies, as well as posters. The Be There staff share these materials with schools and programs to be used with students and families when communicating the importance of attendance. Parents are also important partners and champions of the campaign in the community among their peers and fellow parents. The campaign went beyond messaging to develop a broader community effort that could delve into attendance data and hold school districts accountable. An analysis of attendance data from the 2011-12 school year found that 23 percent of Pittsburgh Public Schools students missed at least 10 percent of the school year. Less than half of those chronically absent high school students had a 2.5 grade point average, the milestone needed to receive a college scholarship through a philanthropic initiative known as the Pittsburgh Promise. Likewise, chronic absence in kindergarten was associated with lower reading and math scores in third grade. 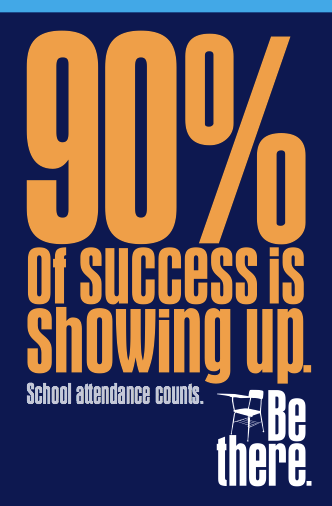 By focusing efforts on building a school culture that includes proactive and positive school-wide attendance improvement efforts, the campaign is able to better reach students and families with the Be There message, and school social workers are better able to use their attendance data to determine supports needed for students. In addition, during the 2014-15 school year the United Way of Allegheny County supported a University of Pittsburgh School of Social Work MSW intern in two Pittsburgh Public 6-8 schools. These interns are responsible for regularly communicating with 20 to 25 students who historically experienced attendance issues jeopardizing their academic performance. The role of the intern includes welcoming the students each morning, checking in with them midday, discussing attendance issues that might arise, and calling home when these students are absent. The MSW student also helps to implement school-wide attendance messaging efforts. Data is showing promising results. As of this March, 40% of the targeted at-risk students have shown an increase in their attendance, while 32% of the students moved out of chronic absence in the past year. This does not include the 20% of those targeted students who stayed out of chronic absence altogether. Be There hopes to launch a similar initiative in additional school districts in the next school year. Allegheny County Department of Human Services (DHS) has a unique data-share agreement with school districts within the county. This partnership allows for the use and integration of data between schools and human services. The information shared is a confidential agreement between the two parties that gives a better sense of what is happening in the home and the community—mental health concerns, homelessness, abuse or neglect—that might be influencing educational outcomes like grades, attendance and discipline. DHS is also instrumental in helping school districts better understand their chronic absence numbers. Fourteen of the county’s 42 districts have signed on to the data sharing agreement and this number continues to grow. Ready Freddy, a program of the University Of Pittsburgh Office Of Child Development works to help children and families have a positive, successful transition through kindergarten. Ready Freddy’s work involves outreach and enrollment, transition, parent engagement and attendance. The program’s attendance work entails a variety of strategies including but not limited to: data review, supportive phone calls to parents, monthly attendance bulletin boards, and rewards for good and improved attendance. Recently one nonprofit partner, Allies for Children, conducted a study that examined how crossing guards are deployed, trained, supervised and connected to the City of Pittsburgh’s Department of Public Safety. The report’s goal is to enable crossing guards to play an even more vital role in the safety and wellbeing of children and youth getting to and from school. The report found that the number of crossing guards has significantly decreased since 2013; there are no criteria to determine when an intersection needs a crossing guard or how a crossing guard is deployed; and hiring and training procedures are not regularly evaluated. The report recommendations will be presented to the City of Pittsburgh and include forming a working group to look at potential practice changes. A+ Schools works to address chronic absenteeism in Pittsburgh’s public schools in a variety of ways. It reports chronic absences rates in its annual Report to the Community and in its School Works action research report, evaluating local schools on a variety of practices that results in recommendations for policy change. A+ Schools provides trainings to the community on important issues that influence school attendance such as parent engagement and restorative practices. Its team of community organizers works to engage parents as decision makers and active volunteers in vulnerable schools, with the hope that increased student attendance will be one of many positive effects on students. Finally, by working to raise the student voice in the district through its Student Bill of Rights and other campaigns, A+ Schools’ citywide youth leadership and student organizing program, TeenBloc, addresses issues that affect student engagement and attendance.